And with such a sense of urgency, I find I’ve been stretching myself all over the place. So much work, I don’t know where to get started! Re-shoot old photos, promote new content, revamp old content, I just want to get everything done all at once. I was driving myself too hard that I was driving G insane along with me! After three weeks of watching me run around like a chicken without a head, he finally had enough. He seriously sat me down and gave me the advice of a lifetime. You can’t be doing these quick sprints or you’ll burn out. Remember you are in this for the long haul. Think turtle and hare, slow and steady wins the race. Rome was not built in one day. Every photo you get to reshoot, every new recipe you post is a step towards your goal. Thanks, my sweet. Like the previous two months, traffic in March remained fairly steady at above 850, 000 pageviews and for that I am thankful. I’ve started to showcase recipes and videos from other blogs along with mine on Kawaling Pinoy’s Facebook page. I am hoping this will help grow the page a little quicker than our normal pace of 20 to 30 new likes a day but, so far, I am not seeing any tremendous growth. The engagement and reach of the page, however, have significantly improved so I am assuming KP readers do find the fresh mix of content useful. I have to say, March income pleasantly suprised me. Given that the first quarter of the year is notorious for the lowest ad dollars, March came in as one of my highest revenue months, next only to December which is touted to be THE BEST month in advertising. As always, I am thankful. Also, this month and for the first time, The Blogger Network surpassed Blogher in terms of revenue, albeit, by a few dollars. This would have been fine and dandy if not for the fact that Blogher occupies all the top premium advertising spaces on my blog and thus, is expected to bring in the most revenue. Unfortunately, Blogher seems to be off on a bad month, or months judging from the horrendous showings on my April report. I do hope the company picks up soon, I’ve been under their umbrella going on two years now (in fact, my old, now-defunct blog was with them back in 2007!) and I’ve been happy, for the most part, with their service and support. I was finally approved back into Amazon after my affiliate account was cancelled a few months ago because of a required form I failed to fill up and submit on time. 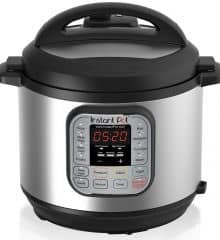 I am going to be slowly adding in some of the recipes Amazon links for kitchen tools and food ingredients you may need. Although I do receive a small commission for any purchase you make from these link, there will be no increase in costs on your end. On last month’s income report, I was kind of re-evaluating my need for a VA since I am now blogging full time and supposedly have all the hours/skills/energy to do Facebook scheduling, pinning, social sharing and et al. After trying to do it all, however, I realized NO, I do NOT have all the hours/skills/energy to do everything! Just the scheduling alone of round-the-clock Facebook shares was too much for my hands! I am actually beginning to feel a slight discomfort around my wrist due to the continuous, repetitive movements and the last thing I’d like is to have carpal tunnel. So, yes, VA stays on my list of expenses. For March, I had a measly total of 7 recipes. Again, BOO me! Please bear with me, folks, as I try to get into the groove of posting daily. Hopefully, I will do better on that in May. Of the 7 recipes, kutsinta seemed to be the readers’ choice of the month. For my top pick, I just love, love, love the sampalok candy. This is one of my favorite treats and I was just happy that it’s so easy to make, I can now enjoy a batch anytime cravings hit. Discipline and organization have never been strong suits of mine. I am hoping my posting these reports monthly will give me some sort of accountability and a concrete picture of what I want to accomplish. I am also hoping the little things I am learning will be of good use to my fellow bloggers and serve as inspiration to our kababayans who are thinking of starting their own blogs but are hesitant about making the jump. It’s time to live your passion-to do something you’re pumped up about and enjoy. Instead of just earning a living doing something you tolerate, harness your passion and do something great. Thank you, everyone, for joining! Don’t forget to check out our winner’s gallery for list of past winners! I am so, so excited to bring you for this month’s giveway these kitchenware sets in beautiful agave blue color which I love, love, love! Again, this is my special thank you to all the awesome women out there who make Kawaling Pinoy the hub for delicious, homecooked meals. Moms rule! We are drawing one (1) winner and for the giveaway prize, the winner will receive a Rachael Ray Cucina 12-Piece Hard Porcelain Enamel Nonstick Cookware Set and a Rachael Ray Cucina 4-Piece Bakeware Set. If winner is from the Philippines or outside of the U.S., a comparative product of equal value will be sent. Please note that Kawaling Pinoy giveaways are wholly supported by me and I do not receive any compensation for the products I present as prizes. 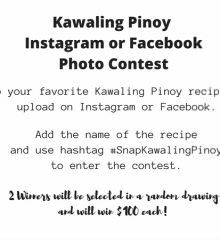 To enter, leave a comment below: What is your favorite recipe on Kawaling Pinoy and why? Giveaway ends 11 PM Pacific Time on Wednesday, May 25, 2016. The winner will be selected via Random.org. The winner will be notified via email and will be announced here on or after Friday, May 27, 2016. The winner must respond within 48 hours or an alternate winner will be selected. No purchase necessary to enter or win. Giveaway is open to residents of all countries and who are 18 years of age or over at time of entry. Kawaling Pinoy assumes no responsibility for late or misdirected entries due to SPAM, technological, or e-mail filtering issues. Hungry for More? Subscribe for FREE to Kawaling Pinoy’s Newsletter today and Get a FREE Cookbook!! My favorite recipe is the CHICKEN SALAD SANDWICH SPREAD because it was so easy to make and everyone loved it. I only just recently discovered your blog, and I am really anxious to try making your melon juice! A few years ago I bought a cantaloupe juice cooler while on vacation, and I’ve been dying to make/drink another cantaloupe juice ever since. I can’t wait to try this recipe along with many others you have shared, so many of the meals look delicious! I’ve got lots of fave recipes and techniques fr your blog and thank u so much for that 🙂 My new Favorite is The honey Garlic Chicken recipe , it doesn’t only taste great but healthy as well. Always looking forward for a new recipe fr you. God bless you and more power! Molo soup is my kids’ all time favorite. Your Fried Okra recipe is the best! Okra is everywhere! So easy to prepare, and goes so good with everything! Don’t get me started on the texture. Yummy! I have lots of favorite recipes from your site. They’re so easy to follow and I love the pictures you take too. One of my favorites would be the Cream Cheese Flan. Making leche flan has always been daunting for me. They would not turn out perfect. But through your recipe, I did it! And I also love cheesecakes. And sometimes the usual blueberry cheesecake seems so ordinary if that’s what you’ve been encountering for a while. A blend of cheesecake and leche flan is always a refreshing twist to an old-time favorite dessert. The first recipe my daughter and i tried is the Cheese Puto and it was truly a hit in our family. My daughter brought it at school , and even made in her Home economics. The instructions are very easy to follow & make and my daughter even make it her small business with her classmates. 🙂 we are now hooked with your recipes then. I preferred much Ginataang Gulay, because eating vegetables for my children is like a punishment for them. It is so easy to prepare and the ingredients are not hard to find. Here in Casiguran, Aurora, coconut plays a major role in majority of food preparations. Usually,my kids opted to eat pinakbet, but in ginataang gulay they started to love eating vegetables especially the added taste of gata, its creamy texture and its enticing smell mixed with vegetables gives a different twist. It’s really hard to choose just 1 recipe !😯 but i would pick the leche flan, because that was the very first recipe on your website that i tried and boy i couldn’t believe that i made the best leche flan i have ever tasted! And that’s all because of you! Thank you so much!!! And from then on, I became super addicted to kawaling pinoy! 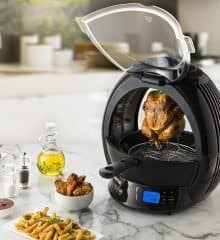 My favorite recipe is Fried Chicken Ala Max because I’ve been searching for that recipe and you make it so easy to make! Hi, Happy Mother’s Day Lalaine! My favorite recipe is Puto Cheese and Fried Chicken a la Max Restaurant because thes e are so easy to prepare and very delicious..
make and very tasty! Thank you for all your great recipes! This is easy. We all wonderful childhood memories of Jollibee back home. The Pinoy Style Spaghetti is a staple recipe in every Filipino gatherings/parties. It’s quiet unique since it’s sweeter than the Italian counterpart plus with hot dogs? Kinda weird. But all my American friends love your Filipino Style Spaghetti as i make it every time there is a party. Your recipe is just perfect, not overly sweet like others. Actually, googling Pinoy Spaghetti Recipe what brought me to your website. Thank you. More power and God Bless!!! Hi Lalaine, Happy Mother’s Day. I love all your recipes, especially the ginataan ones, savory and sweet, both, easy to follow and the ingredients are easy to find. keep up the good work. can you print some more pickled recipes? and more vegetarian recipes too pls. Thank you. I LOVE Fried Chicken a la Max’s. I’ve also tried other Max’s friend chicken recipes, but this is the one that my family liked. Thanks for sharing good stuff! My favorites are: Cream Cheese Flan, Baked Macaroni, Cheese Pineapple Sandwich Spread, Coconut Macaroons, Fried Bananas with Salted Coconut Caramel Sauce, and Adobong Itlog. Thanks ate Lalaine for inspiring me to cook more for my husband. I learned a lot of dishes and I’m more confident in the kitchen. My favorite recipe from kawaling pinoy would be the cream cheese flan. It has given the regular leche flan a notch higher. Nothing would beat this recipe as it so so far the creamiest and smoothest leche flan I have tasted. I would definitely continue serving this to my family and hopefully to my own family in the future. My favorite recipe here is Igado. I’m not a very experienced cook and I love that your recipe was easy to follow and yields great result. The first time I tried making Igado it was a blockbuster to hubby. Thanks, your blog is really a big help for noob cooks like myself, it gives me confidence in my kitchen skills and makes my family happy and satisfied at mealtimes. Bless you! Hi Laine! Love love love kawaling pinoy! The yummy and easy recipes helped a lot in dealing with my picky daughter. My fave is beef tapa! Again thanks a lot and more power! I love Chicken Adobo withLiver Spread. My husband is the one who cooks our meal because he cooks well than I do. But when I cook Chicken Adobo withLiver Spread everybody is excited to eat. I am proud to say that I can cook better adobo than my husband do. Yohoo! My favorite is the Crispy Fried Smelt Fish because fried smelts are something my dad used to make when I was growing up and they were delicious! Haven’t had them in a very long time. My sister is always requesting Filipino spaghetti! In the last month, I have made plenty of your recipes. My favorite one is the ginataang talong. OMGGGG so many flavors. Growing up I never really ate my mom’s ginataang. But when I made this that night, I kicked myself because I realized I have been missing out my entire life. Your recipes have opened my mind and tastebuds. Thank you so much! My favorite Kawaling Pinoy recipe is the BBQ pork on the stick, absolutetly delicious. Thank you for your blog and for your inspiring message. Awesome! Realy inspiring post. I am always motivate after reading your blogs. Thanks for the insights. My favorite is avocado ice cream because it’s refreshing and beautiful! I love seafood and gata so I really enjoyed the ginataang seafood recipe. My family was impressed. Yum! I love the fried smelt fish recipe. It’s so simple but it reminds me of my childhood snacking. I worked as a food Service Director for almost 30 years and I never imagine myself making dessert from scratch.As my 3 kids grown, I kinda tried baking . when I tried the leche flan,OMG it went viral to all my family and friends.Since then, I always searching for dessert recipe.Bilo-bilo,maja blanca,cheesecake cupcake and I become the dessert queen every time we have gathering. thank you so much for sharing all your recipe. My favorite recipe is the melt-in-your-mouth leche flan. It’s perfectly creamy and yummilicious!!! My favorite recipe of KP is your Filipino Coconut Macaroons. My mother who is not a fan of sweets can’t get enough of it. Even my son who is a picky eater requested it for his birthday. My Lalaine, my ever favorite recipe is the Cheese Cupcake! My family loves it so much… Hope I can won! God bless! Very easy to prep & the results were amazing! Im really curious to try the mais con queso ice snack recipe that you just posted, that is a taste combo I love and reminds me of family. My favorite would be your menudo recipe! When I was kid there’s this karinderya near our home that makes really good menudo. Every week, we would buy from Manong and my siblings and I would devour it in a heartbeat. I even liked bringing it as baon for school! I’ve always wanted to know Manong’s recipe but never had the chance to since he died a couple years ago. COCONUT LIME CHICKEN!!!! So easy to make yet so flavourful! Thank you so much for the recipes. I like ginataang gulay, simple yet scrumptious! I had tried your Shrimp with salted Egg and it was indeed a sure hit to my family, so I made this dish again to present to my sister-in-law together with her German husband during their visit and happy to say that they both love it. Thanks again for sharing it. Thank you for sharing your recipes with us. I love kawaling Pinoy’s Kare-kareng pata. This is so delicious. My family loves eating this. Before i learned about your recipe, i cannot cook this especially loved meal. I like kare kare so much that whenever we eat at Barrio Fiesta, i ask my husband to buy one order for take out. But since I learned of your recipe and tried it, WOW! , I do not buy cooked kare kare anymore. I do it by myself and it tastes so delicious that my family always request for this meal, especially on weekends. Love your Butchi recipe. My husband loves butchi. Whenever we eat at Chowking, he never fails to order the lauriat as it has butchi with it. Thanks for the recipe. Love your other recipes as well. My favourite recipe is cassava cake with leche flan topping. I discovered your blog through that recipe and have since tried other recipes, like the egg custard pie and taho. My favorite recipe is Empanada…..why?..because it can be served any occasion…and I love the crust that your recipe produces. Your lengua with mushroom sauce recipe have been a mainstay in my menu plan. I’ve also paired the mushroom sauce recipe with other meats and it tastes great! My whole family loves it! Thank you so much and looking forward to more recipes! More power to you! I’ve true caldereta and it is ny favorite. I love to eat karekare but i dont know how to prepare nor cook it. But when i got married,i started to learn different kinds of menu based on of course by my favorite recipe. I started to search online recipe and found your kare kare recipe. Since then almost once a week i cook kare kare for my family. They enjoyed how i prepared it and i owe it to you..God bless you.. Your recipes are all wonderful. But I still can’t get over Beef Tapa (the new recipe). I marinate and store them in the freezer. Whenever I feel the craving or at a pinch, I can make the beef tapa from the freezer with a little thawing time needed. My favorite Kawaling Pinoy recipe are the POLVORON and GRAHAM BALLS.. my kids love it!!! preparing this allows us to bond together..they enjoy doing it..and even selling it..hahaha? Thank you so much Kawaling Pinoy!!! Pinakbet with crispy lechon. Your recipe reminded me of my mom’s ( God bless her soul ) cooking. I learned from her that by cutting the vegetables a little bit bigger and not over cooking keep all their nutrients and flavours. Adding crispy lechon is like icing on the cake. Bravo to you blog, loving it. My favorite recipe is Kare-kare. It’s my husband’s favorite Filipino dish and it took me a while to find the recipe just like my Grandma makes it. And I found it at Kawaling Pinoy! Keep up the good work. The house special fried rice because I love anything fried rice. I love your chicken afritada and lumpiang ubod. My husband got a new favorite and it’s always part of our weekly menu. My husband and i both love the sampalok candy. It’s so easy to make and delicious. We can’t get it here in Colorado, and am glad we can make it now. Thank you! My favourite recipe from your blog is Chicken Afritada because it takes simple ingredients and through the cooking method of browning each ingredient separately, the flavours of each ingredient are deliciously enhanced and also the colours are amazingly vibrant and the dish just looks gorgeous. I love your blog and am happy for your success…keep up the great work and excellent recipes! Our favorite is Bake Tahong with sweet chile mayo topping. This recipe is now a staple In our party. Thank you Kawaling Pinoy for amazing Filipino recipe. My most favorite Kawaling Pinoy recipe is Pan de Sal. Thank you for your generosity with your talent and knowledge. I’m an avid fan! More power to you, Ms. Lalaine! My favorite receipe is still the astute ribs. So tender and flavorful. Keep up that good work! Kawaling Pinoy is my everyday go to for everything. Today I’m going to make one of my favorites – Lechon Sa Hurno. Lalaine you’re the best and I “so” want to be you!!!! Congratulations! You’ve come a VERY long way!! The best of luck to you!!! My favorite recipe is chicken inasal. I saw this made on TV searched for the recipe and found your site. I’m hooked now! Mango and Cream cheese Turon!!! Because of its unique twist on our favorite turon that is usually banana and langka. Me and my gf loves mangoes and cream cheese so its a marriage made in heaven. My favorite is the Mango jam, yumminess in a jar! Hi Lalaine! More power on Kawaling Pinoy! My favorite recipe here is the Tokwa’t Baboy. Tokwa is really my favorite. I once cook this recipe and paired it with Lugaw and serve it with my husband’s relative as merienda, It was a hit, they really like it! It is really hard to pick one single favorite recipe because I am an avid follower of your blog for more than a year now. But the most unique recipe that I have tried was the Mango Curry Chicken. The family loved it! One of my favorite recipe is Honey Walnut Shrimp. The only place I get to eat Honey Walnut Shrimp is from a Chinese restaurant and that’s not very often. When I tried to make your recipe, my daughter whose 4 yrs old loved it and of course the husband agreed too. Mango bread loaf is my favorite sweet fix from Kawaling Pinoy! My favorite recipe is cathedral window gelatin. The first time I made it is last Christmas of 2015, all my grandchildren are delighted with its feature and they are amaze of the different colors. At the time they started eating this, you can see the satisfaction in their eyes and they are very much delighted of its taste. Since then, i’ll prepare it every week. The day is not complete without this snack. My favorite Kawaling Pinoy recipe is the Leche Flan. Whenever I have been able to enjoy this dessert at a family gathering or party, I’ve always thought there’s no way I could make this, this good! But your recipe is exactly as you marketed: the smoothest, creamiest, most melt-in-your-mouth leche flan you’ll ever have the pleasure of trying. And I was pleasantly surprised at the ease and simplicity of prep and cook time involved. Thank you, Lalaine♡! I have to say, after making a batch of that candy you mentioned, I am hooked!!! 🙂 It’s my new favorite recipe from you. Thanks so much for your giveaway opportunities!